Young birds are leaving the nest, and many of them are getting ready for their first trip south. Migration is a hard and risky business for any bird, but the first marathon voyage for many species of birds takes place shortly after they have fledged. How do they do it? 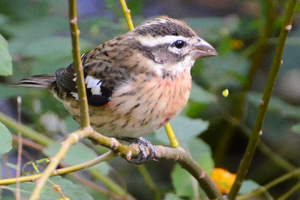 Songbirds such as American Robins and this young Rose-breasted Grosbeak are born nearly naked and completely helpless. They remain in the nest while their parents work overtime to provide protein-rich insects and other food for their babies. When the chicks fledge, they have strong instincts that will guide them to their wintering grounds. They don’t need to follow their parents, although they often fly together on their first migration. Crane chicks are born with fluffy down feathers and are precocial – meaning they are ready to go right away. They leave the nest and bravely follow their parents across marshes, fields and river banks, learning everything from them – from how to find food and avoid predators, to when and to where they are supposed to migrate. Unlike most birds that migrate, Sandhill and Whooping Cranes don’t instinctively know where to go on migration, and if they are not shown the way, captive bred birds remain where they were born. Shorebirds are an extreme example of instinctive behavior. Similar to cranes, shorebirds are born with fluffy down feathers and are precocial. But, unlike cranes, they get very little help from their parents. After fledging, young shorebirds must fend entirely for themselves, and their parents usually leave for migration before their chicks. First-year shorebirds make incredibly long, sometimes multi-day, flights entirely on their own or with a few other first-year birds – none of whom have flown the route previously.